I have had so many lovely comments about my rounded bunting/banners on my wreath and even more recently, on my mantle, I thought I'd share the how-to if you'd like one for your own home. I like mine so much, so far I've made a fall themed mini bunting, a Christmas bunting, and the wintry featured in this tutorial. Let's get started. You'll need to download your template from HERE. I recommend printing it on cardstock so it will stand up to repeated use. Scraps of fabric, at least 5" x 2" for the smaller size, 8" by 3" for the larger size. Matching double-fold bias tape, about 60" for a wreath, or 108" for a mantle. Sewing tools; including scissors, seam ripper, pins, and sewing machine. Optional, and very helpful, pinking shears. Step one. Trace the template onto your fabric, and cut out the number of rounded pennants that you need. For the wreath, I made 20. For the mantle, I made 18. You can adjust this depending on the length of bunting you require. Step two. Sew the pennants together. Fold the pennants in half, right sides together. Carefully sew a 1/4" seam from the fold, around the curve, up the other side. Step two. Trim the pennants and open the top. I used my pinking shears to trim and clip curves in one step. If you don't have pinking shears, you will need to cut small notches around the curve to allow for a smooth appearance once the pennants are turned right side out. 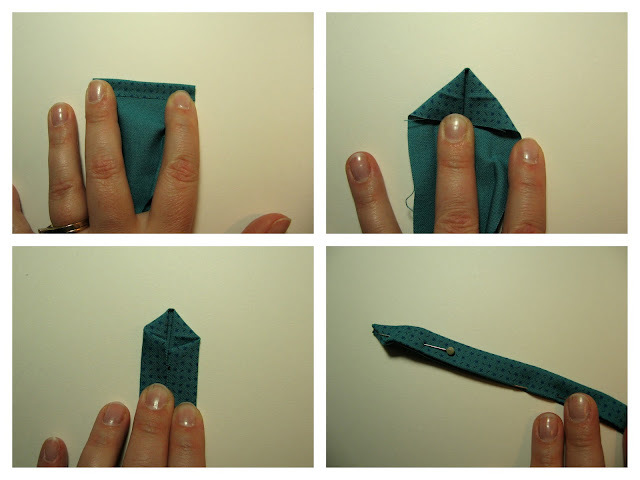 You will also need to cut a small sliver of fabric off the top of the pennant to open up the top edge. This will allow you to turn them right side out. Step three. Turn and press. Use your fingers to push the fabric out as much as possible. At this point, you may notice a few seams may need to be adjusted. Easy peasy, turn the pennant back wrong side out and resew the seam. No worries. This will really help the pennants stand out and look nice. I was concerned with how well the larger size pennants would stay pressed, so I topstitched each one 1/8" from the edge. Step three. Baste the pennants to bias tape. Open up the bias tape, and starting from the center of your tape, place the pennants at equal distances. I used a safety pin to mark the spaces between the pennants, and pinned as I went. Baste the pennants to the bias tape, removing the pins before your needle gets to them. Step four. Finishing bias tape, and sewing it all together. I like to add a decorative fold to the ends of my bias tape. To make it, I first fold in the end about 1/4". Then I fold each side into the center to make a triangle. I fold the bias tape back in half, and then pin in place. Once the ends are folded and pinned, continue pinning the bias tape into it's original folded position, with the basted pennants tucked inside. Sew the entire length of bias tape with a 1/8" topstitch. Once your bunting is complete, you can thread it through your wreath, or hang it on your mantle. One Pretty Thing, Someday Crafts, Craft Gossip, Polly Want a Crafter, IShareCrafts, and How Does She! Polly Want a Crafter, Blue Cricket Design, Somewhat Simple, Tatertots and Jello, Along for the Ride, and Creative Jewish Mom. sUPER CUTE. So many possibilities. I am featuring this at somedaycrafts.blogspot.com. wonderful tutorial. You know how much I love this and your door (!). Just saw this featured on One Pretty Thing - they have very good taste. Great tutorial, Chris! This could be used in so many different ways. Love the bias tape connecting them. Cute idea! Another great way to work through those fabric scraps. I love the colors on this one. Thanks for the tutorial! It really is so cute! I love it each time I see it. Great project, love how it looks on that red door! and thanks for sharing the tutorial, I know how much work that is! Great to see you again on Craft Schooling Sunday, all the best! You are so creative. I am so glad to have come across your blog. I am so excited that I finally got to make this! Thank you for the wonderful tutorial, you made it so easy!